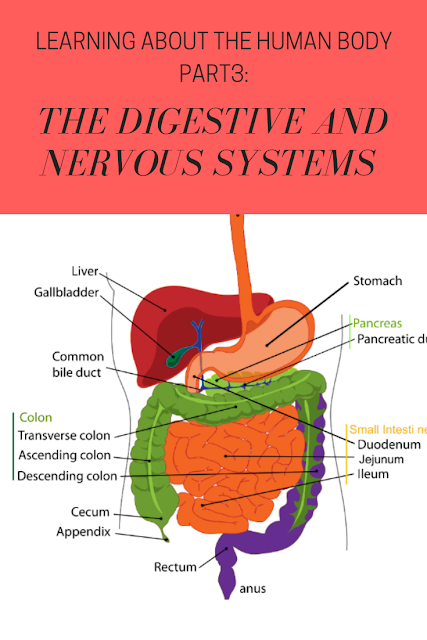 The last two human body systems we studied in depth this year were the digestive and nervous systems. My daughter especially enjoyed the nervous system and learning about the body's senses. In part 3 of my Learning About The Human Body series, I share a few of the activities we did and resources we used to study these two systems. If you haven't already, you can read Part 1: The Skeletal And Muscular Systems here, and Part 2: The Respiratory And Circulatory Systems here. The human digestive tract consists of the mouth, esophagus, stomach, small intestines, large intestines, liver, gall bladder, and pancreas. It's the system responsible for taking nutrients into the body and processing them so they are ready to be transported by the circulatory system to all the cells of the body. Make a stomach in a bag to demonstrate how the acids in our stomach and the churning motion of our stomach helps to digest food. Place a piece of bread and 2 tablespoons of water and tablespoons of vinegar in a ziplock bag. Have your child squeeze the bag, simulating the churning motion of the stomach. Observe how the bread breaks down to an almost liquid form. This is what food looks like as it passes from the stomach to the small intestines. -The Digestive System from ducksters.com- some kid friendly general information about the human digestive system. 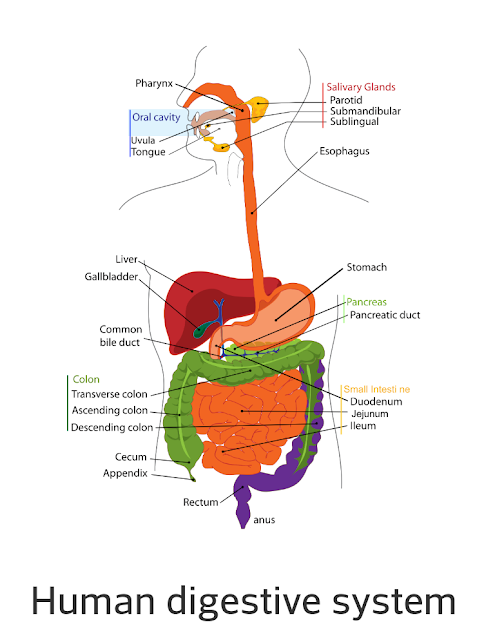 -Digestive System from Kids Biology- learn about the parts of the digestive system and how it all works. The human nervous system is made up of our brain and and a complex system of nerves that carry signals back and forth between the brain and body. The brain controls our body's every move. Explore the 5 senses with this simple activity. Take your child outside and have him or her close their eyes. Then focus on each sense, one at a time. 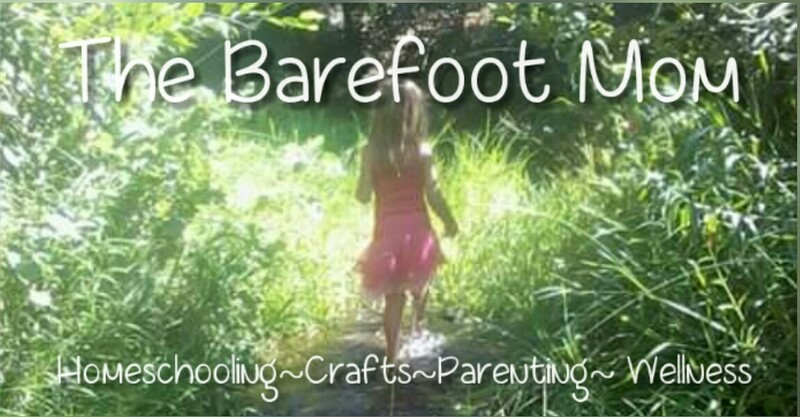 Have your child describe what they smell, what they hear, maybe they can feel a breeze? Then have your child open his or her eyes and describe what they can see. Talk about how each of your 5 senses collects information from the world around you and sends that information to your brain. This is a simple way to demonstrate why we get dizzy after we spin. 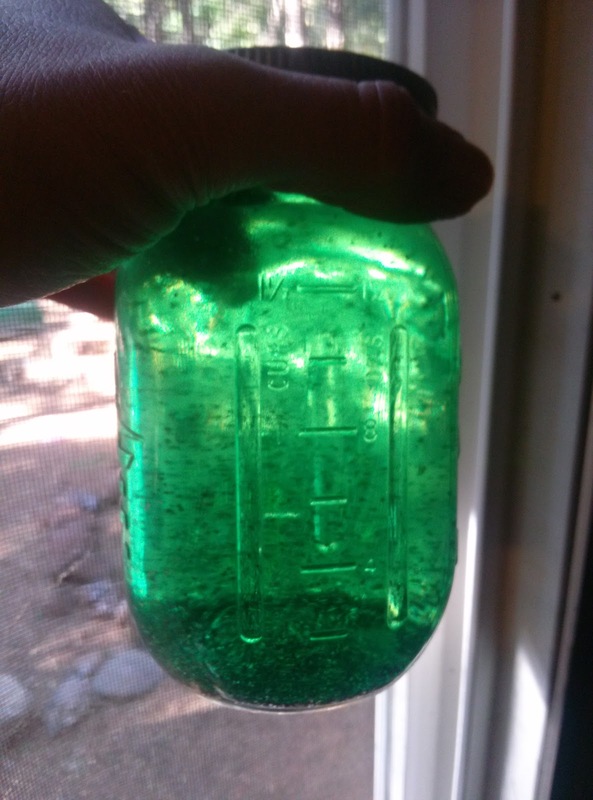 -A large glass mason jar with a tight fitting lid or a clear 1 or 2 liter soda bottle. Have your child spin around in circles about 10-20 times. Ask them how they feel afterward. Do they feel dizzy? Does the room still feel like it's spinning? Fill your bottle or jar up with water. Add the glitter and place the lid on tightly. Spin the bottle around several times and set flat on a table. 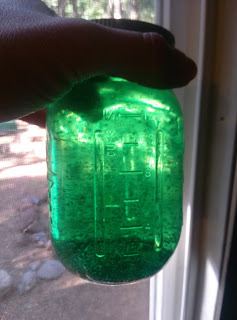 Observe what happens to the glitter and water. It should keep spinning for a bit even after the bottle is set down. This is exactly what happens to the fluid in our inner ears when we spin. It takes the fluid a minute to stop spinning after we stop. Our inner ears send signals to our brain helping our bodies to stay balanced. When the fluid is spinning our inner ears tell our brain that the body is still spinning even though we've stopped. This is why we get dizzy after we spin! -The Nervous System from ducksters.com- some kid friendly general information about the human nervous system. -Neurons Model Activity from Solagratiamom- has instructions for making your own neuron model with household items. Learning About The Human Body Part 2: The Respiratory And Circulatory Systems.